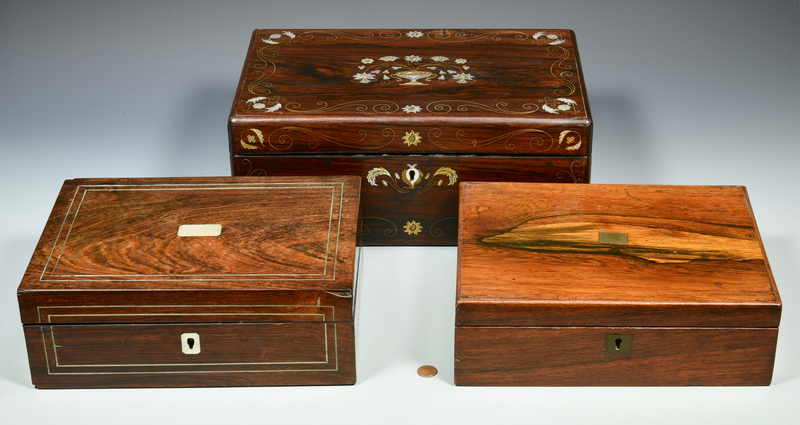 Three (3) Lap or Travel Desks, 19th century. 1st item: Rosewood and mother of pearl inlaid lap desk. Lid features a mother of pearl-inlaid urn with florals, brass inlaid foliate border and pearl floral corners. Front of box with brass inlaid foliate border, mother of pearl inlaid escutcheon, interior with baize covered writing surface and four wells (for ink bottles). A secret panel below the well opens when a brass latch is pushed in one of the wells, and reveals two secret drawers with ebonized fronts. 6 1/4" H x 15" W x 10" L. 20" L when opened. Mid 19th century, English. 2nd item: Rosewood, mother of pearl, and silver metal inlaid lap desk. 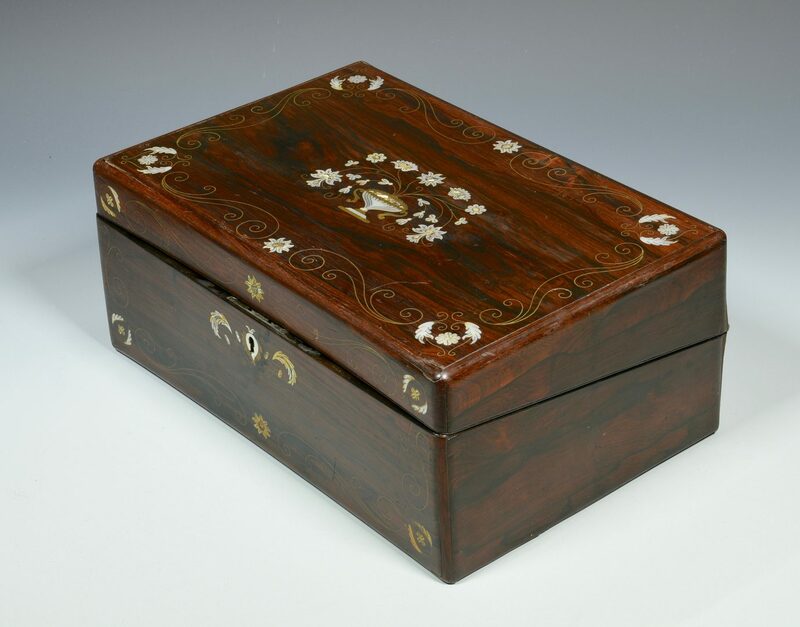 Lid features a mother of pearl inlaid rectangle with double metal inlaid border. 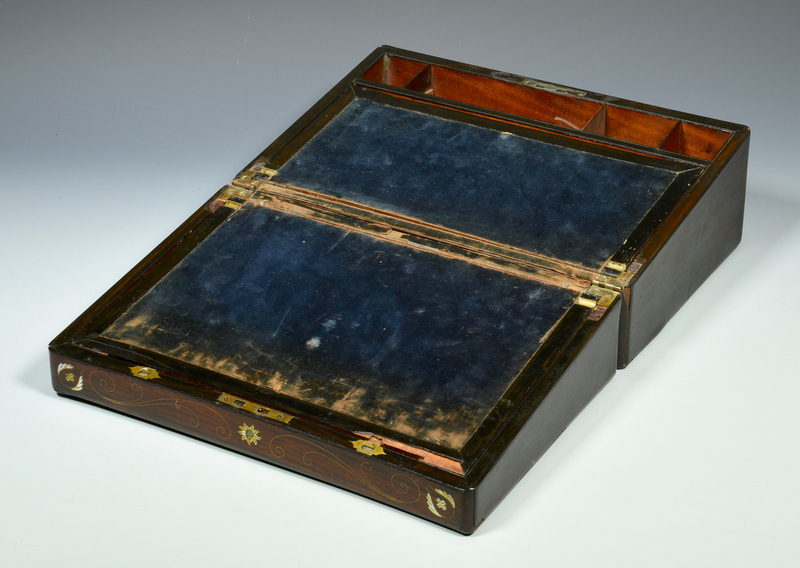 Double border repeated on front of desk with mother of pearl rectangle inlay over keyhole, interior with brown felt covered writing surface, two designated recesses for wells left and right, one well filled with sand, and designated recess in center for orange wood and metal writing stylus. 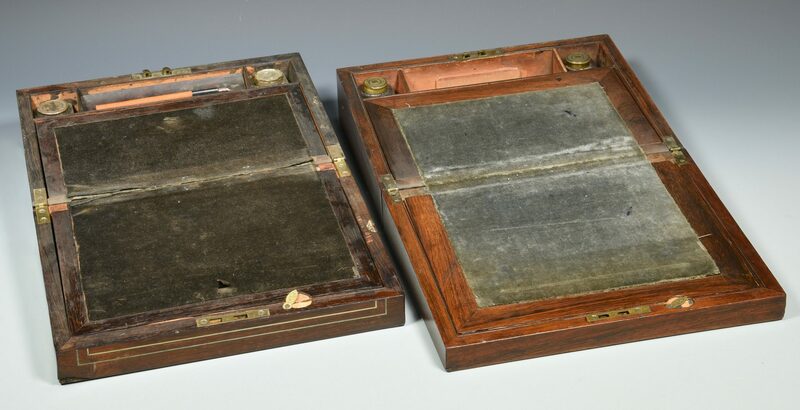 Three secret panels, one below the lower portion of writing surface, one revealed behind brass latch at top of writing surface, and one below recess for writing stylus. Writing stylus incised MADE IN ENGLAND on metal tip, manufacturer mark illegible. Five pieces of paper ephemera related to pharmaceuticals found behind top secret panel. 4 1/8" H x 11 7/8" W x 8 3/4" L. 17 1/2" L when opened. 19th century, English. 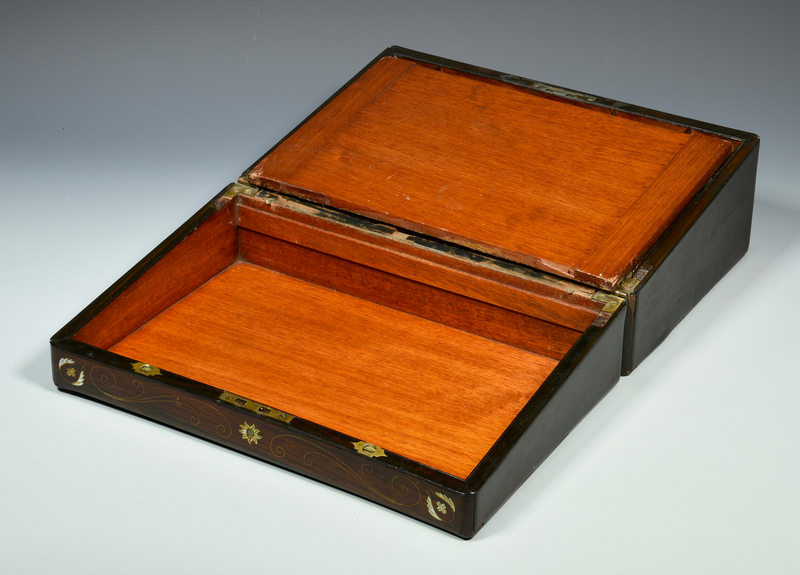 3rd item: Rosewood and brass inlaid lap desk. 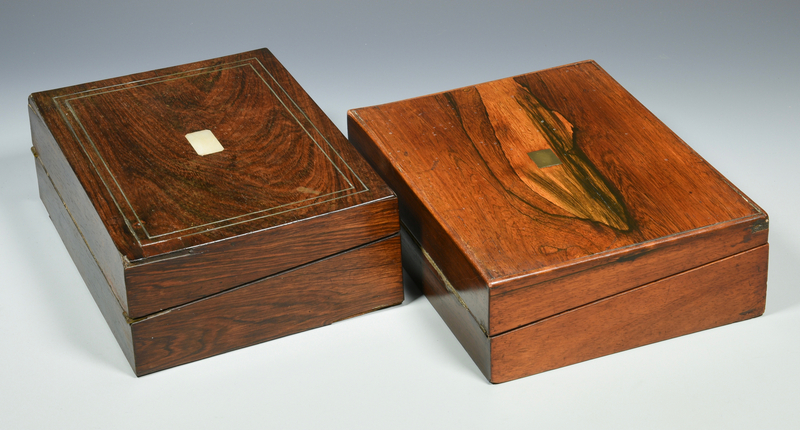 Lid features a brass inlaid rectangle, brass inlaid rectangle repeated on front over keyhole. Interior with grey felt covered writing surface, two designated recesses for wells left and right, and recess in center. Two secret panels, one below the lower portion of writing surface, one revealed behind brass latch at top of writing surface. 3 3/4" H x 12" W x 9 1/2" L. 18 7/8" L when opened. 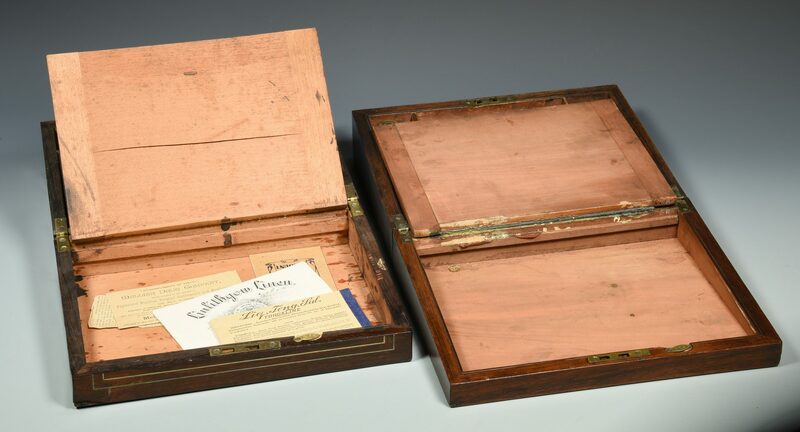 CONDITION: 1st item: Brass hinges for interior writing surface loose and with losses, losses to edge of writing surface at both ends, veneer separation at corners on box exterior, key is missing and lap desk does not currently close. 2nd item: Cracks on surface and corners of lid, silver metal inlay raised and tarnished in several areas, mother of pearl inlay scratched, interior felt worn and peeling from wood in places, rust on stylus, general wear and tear of lap desk, key is missing and lap desk does not currently close. 3rd item: Cracks on surface and corners of lid, interior felt worn with ink stains on places, general wear and tear of lap desk, key is missing and lap desk does not currently close.